Despite previously serving as an auxiliary bishop of Paris and then, in 2014, being appointed by Pope Francis as Bishop of Nanterre, a suburb of the city, his name was rarely discussed as a likely successor to Cardinal André Vingt-Trois, who held the closely watched see for more than a decade. But if news of his appointment came as a surprise to the Catholic chattering class, it was met with equal shock by Archbishop Aupetit himself. In an interview with The Tablet in May – his first to an English-language news outlet since his installation in January – he recalled hanging up the phone after receiving the news and being asked if someone close to him had died. Yet less than six months into his new role of overseeing more than 100 parishes in the center of the country long known as the “eldest daughter of the Church,” he’s well aware of the responsibilities and challenges that rest on his shoulders. In the shadow of Les Invalides – the 17th century military complex built as a hospital and retirement home for war veterans, which now serves as a military museum and the final resting place of Napoleon Bonaparte – stands the residence of the Archbishop of Paris. While historically, the archbishop resided at the city’s great Cathedral of Notre Dame, more than a century ago, a wealthy French Catholic widow left her residence – a hôtel particulier – to the archdiocese under two conditions. First, she asked that in exchange for the property, the Church would pray for the soul of her late husband, whom she believed to be less than devout. Secondly, she wanted the home to serve as permanent residence to the city’s archbishop. Here, Archbishop Aupetit both lives and holds court – even if a bit reluctantly. Incidentally, the late Cardinal Jean-Marie Lustiger, who presided over the city for nearly a quarter-century, wanted to move out of the residence and return to the action of Notre Dame, but stayed put once he was reminded that, if he left, the archdiocese could lose the property. Like Cardinal Lustiger, who is fondly remembered for his magnetic personality and charisma, Archbishop Aupetit is eager to be out in the field. “I am thinking of how I can reduce time in meetings and spend more time in the field,” he tells me – playfully adding this very interview is preventing him from doing the thing he’s seeking to prioritize: being with his people. “I’m not here to put into place my ideas, but to take ideas from the people and work with them,” he adds. Tending to people, in fact, has been a central theme in Archbishop Aupetit’s career, which began not in the priesthood, but instead when he earned a doctorate in medicine in 1978. He would go on to serve as medical doctor for nearly two decades, specializing in bioethics, before finally being ordained as a Catholic priest in 1995. Twenty years later, however, the city where he was first ordained a priest is a radically different one from when he first entered ministry. In recent years, Paris – a city known worldwide not just for its beauty, but also for its vigor – has been rocked, and by some accounts weakened, by several high-profile terrorist attacks. Tensions between French-born citizens and immigrants, the majority of whom are Muslim, run high, which, along with larger economic woes, have fueled the broader nationalist tides that have swept through Europe. The Church, for its part, despite some promising signs of renewal, such as a steady increase in Mass attendance following terrorist activity, has struggled to respond. Yet in a recent and almost unprecedented event, French President Emmanuel Macron accepted an invitation by the French Catholic Bishops to address them at a conference in Paris in April, and he offered an invitation to the Church to make its voice known, even if it wouldn’t always get the outcome it desires. For his part, Archbishop Aupetit is looking to accept that invitation. Although he’s only met Macron on two occasions, he describes their interactions as cordial, and believes Macron has the “right vision” of laïcité, a French term describing the separation between religion and matters of the state. While some have weaponized the concept, others – such as Archbishop Aupetit – believe that, properly understood, laïcité recognizes the value that the Church can bring to public life, while acknowledging the necessity of the two separate spheres. Case in point: One of the occasions for the Archbishop meeting Macron was a dinner at the Élysée Palace, the official residence of the President of France, to discuss end of life issues, particularly euthanasia. One of the primary issues looming over both the country’s Catholic bishops and the French legislature at the moment is a bioethics bill that will consider this question, as well as whether to allow in vitro fertilization (IVF) for single women and lesbian couples – something Macron campaigned for during his 2017 presidential bid – and the question of surrogate parenthood. 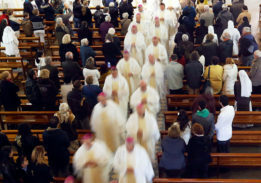 For his part, Archbishop Aupetit believes it will be hard to resist the efforts to allow for IVF, but he believes the government “won’t move forward” with efforts to legalize euthanasia or surrogacy (which Macron has voiced opposition to), though he worries that this new bill will be a “first step” to its eventual legalization. Here, he seeks to step back and ask fundamental questions before discussing the specifics of the law itself. “The real question is, what kind of status do we give to the child? How do we look at him? Is he a gift or a right? Is he an object or a subject?” he asks. While some may view Archbishop Aupetit as a traditionalist on bioethical questions (among his previous books, one is on the embryo and another on contraception), he’s eager to have a modern discussion about their relevance. Throughout our interview, Archbishop Aupetit strikes a similar tone as the man who named him to his post – a man that he admits he doesn’t know well, but says they share in “good humor” together. “He’s a true pastor, a people person,” he adds. When we met, Archbishop Aupetit was fresh off a meeting with Pope Francis two weeks earlier, and he says he was surprised at what the pontiff knew about the Church in France, adding that they even talked at length about the tendency of younger priests to be too rigid in their pastoral practice. When I inquired about doctrinal controversies over “Amoris Laetitia,“ Pope Francis’ 2016 apostolic exhortation on family life that provides a cautious opening to communion for divorced and remarried Catholics, he seemed unfazed. He points to a recent conference held in Paris discussing the three most recent popes, saying that the focus of St. Pope John Paul II was often moral theology, with Pope Benedict XVI the theological virtues, and now with Pope Francis, it’s pastoral application. “If you look at the whole, it’s completely coherent,” he insists. At the five-year mark of the Pope Francis papacy, he’s willing to admit that some of the anticipated and hoped-for internal reforms of the Church have yet to be accomplished. But, he believes that doesn’t mean that change isn’t afoot. At age 67, Archbishop Aupetit possesses the same energy and dynamism that might be more commonly found among younger priests. Perhaps it’s given his late vocation that one gets the sense he feels like his pastoral work is just getting started. While his work schedule is bogged down with formal meetings and requisite public appearances, he says his first priority is to spend time getting to know the priests of his diocese. With many prelates, the more spotlighted events in the life of the Church or within their diocese seem to preoccupy most of their time. Not so with Archbishop Aupetit – or at least not yet. “Will Pope Francis visit France?” I ask. “Probably not,” he says with little disappointment – not because he doesn’t want it to happen, but it’s not seen as a priority. Will he participate in the upcoming Synod of Bishops in October on young people? It remains to be seen, he said, but dreads the thought of being away from his diocese for such a long period of time. In other words, while recognizing the importance of such happenings, he’s also not spending much time dwelling on things outside his own backyard. “I believe more in persons than in systems,” he says. Looking ahead, he knows European elections loom later this year, and that the nation continues to be paralyzed by fear of terrorism. Paris recently endured yet another fatal knife attack motivated by terrorist activity. And the archbishop is expected to be the shepherd to a wounded flock trying to make sense of it all. When asked what makes him hopeful, he pauses, and then, in an interview, which has been conducted primarily in French, he switches to English, as if to punctuate the point further.